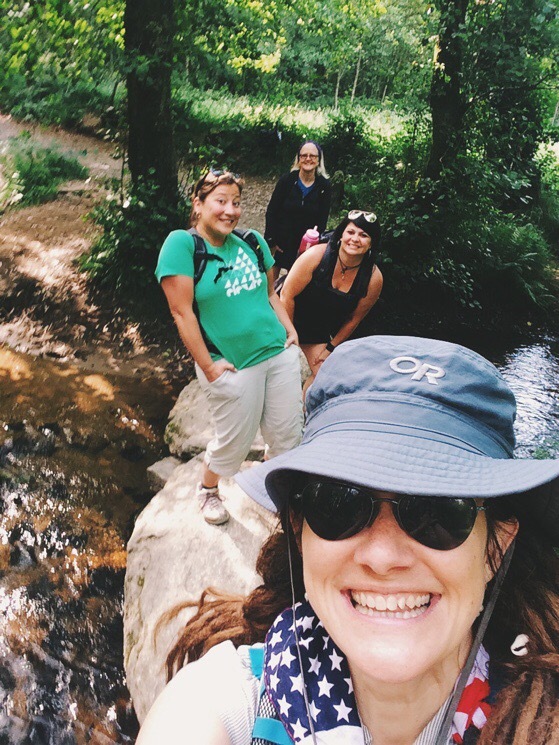 I’m reaching the end of my stories and snippets from the Camino de Santiago, and I feel similar to how I felt about finishing the journey in June. The treasure in blogging is that I get to relive the memories as I tell the stories. And the princesses have relived them with me. So I wanted to share a little word from each of them about our pilgrimage. Especially after our silly snapshots of our princess life yesterday, I thought it would offer a bit of balance to peel back some of the ridiculous to see the great big hearts of each of these dear women. They reminded me that everyone on the Camino has a story in their hearts about why they are walking and what they are learning. Words from the Pilgrim Princesses. I gained a new appreciation and love for the beauty of the world, the people in the world, and the life that others live. That we are all so different and yet the same! That I can see the beauty in each person that crosses my path and feel better off for it. I loved experiencing all the wonderful things on the Camino with my Princesses-walking, talking, singing, praying. Going through fields and forests and being at the beach- sights, sounds, colors- all beautiful! I loved that everyday was a new experience. I love the physical challenge. I loved the people of Spain and the pilgrims we met. I loved the food. I loved the flowers and the churches and the markers. I loved it all and doing it together! I started this journey knowing that my hardest road to walk this summer was going to be the letting go of my oldest child who finished high school this year. I had no idea how God would meet me in my grief over the end of this season of my life. I was not sure how to face having three children around the table each night instead of four, much less the grander questions over futures unknown, but God showed me that the way I move forward is by trusting that He will always have a place for Cole at a table somewhere. He will provide for the things I think only I can give to my children, and actually He will do it better than I ever could. I can release my need to be needed by them in the day-to-day. I watched God provide for so many details for people on the Camino. Sometimes He used me. More often I watched in awe as He used someone else. In the simplicity of a daily journey of walking and talking and eating and drinking, I witnessed that each of us has a role to play, and we don’t have to do any more or less than just what we are given to do today. My role as primary caretaker and giver of counsel in my son’s life has come to an end for now, and instead of grabbing back for that role every time I interact with him, I want to let go with grace and watch how God fulfills those needs in my son’s life. The Camino experience for me as been without a doubt a moment in time, which I truly wished I could freeze. (Where was my Fairy Godmother?) The overwhelming anticipation alone kept me awake many nights!! Researching, reading, watching movies, and documentaries about The Camino. Nothing could have prepared me for what an adventure I was to live! The beauty of the Galicia Region of Spain was breathtaking! Every element contributed to this beautiful land, with every step I felt spellbound! The climate could not have been more perfect. The food, and oh the wine, how could one describe the magical sensation of the wine? When I let myself think, really stop and think of the History, Religion, and the sacrifices that Pilgrims have made, it brings me to my knees! I am so humbled to walk along this path. The people of Spain, their pride, enthusiasm, eagerness to serve, I desire to be as they are. The Pilgrims I walked alongside, ahead of, and behind, they are my biggest “treasures” on The Way!! I believe in the Power of People!! People feed me, they inspire me, they motivate me…. I have an ache to acknowledge them, I long to know their stories or whatever part they feel they can give, I want them to know I will listen, with care, and help them in whatever way is possible! It is a gift to know a person, however fleeting a moment may be, to see one of God’s creations open up like a flower, to give of themselves, or even when they don’t give, I feel an obligation to them. God placed me there in that moment, with THAT person. I must give what I can, if only an acknowledgement or a prayer. My forever, from The Camino, are my precious friends!! The investment we have together, will forever bind me to them! My love abounds for these friendships!! My God, only You, all knowing, could possibly know that I needed The Camino! You blessed me with a husband who could make the sacrifices. My spirit has been reignited, full of gratitude, love, and hope. Bonus: Here’s a sweet video of us all talking about The Way.